I’ve got a problem with sides. It’s not that I don’t care about them; in a restaurant I carefully study accompaniments, and have been known to turn my back on a perfectly good piece of fish because there was talk of a persimmon on the plate. Care! But when I am cooking at home during the week, I tend to forget about side dishes all together. Partly it’s my congenital meal planning deficiency. There I am, thinking deep thoughts about my protein, wondering if I have mustard in the house, or if my sage is wilted, or how exactly one butterflies a pork loin. Then, my brain suddenly skips to dessert. Wouldn’t it be nice to make a budino? But I don’t know how to make a budino, so will pudding do? I am also done in by a certain amount of laziness. Side dishes often involve lots of chopping, and some copious washing, too. Who wants to face a salad spinner on a Monday night? The net result is that my family is often stuck with some nice basmati rice or steamed broccoli, the plain white t-shirt of vegetables. Trolling food52, I stumbled up Rohit Mitter’s simply Roasted Cauliflower, and was instantly intrigued. Its central allure was its compatibility with my pantry. After procuring your vegetable for this, I am guessing you too have some powdered ginger, olive oil, salt and garlic on hand, as well as some sort of “red chili powder,” which I interpreted broadly as any chili powder you have used in any amount you deem palatable for what you’re about to pour on your cauliflower. Now working with a community-based recipe site means constant thrills, but also some creative license. Are you there Rohit? It’s me Jenny, and I need you to tell me what you want me to do with this garlic. I also could have used some guidance on the amount of olive oil to include. On the garlic front, I chopped it finely because that just seemed intuitively correct. I used about two teaspoons of olive oil, so my dressing was more like a paste; I would go with a nice heavy tablespoon next time. Once you have drizzled this concoction on your pretty vegetable, you roast it while you go on about your business, which is probably cooking something on your stovetop, or continuing to fantasize about dessert. Let’s bottom line it: when cauliflower meets a hot oven for a 45 minutes, something good happens, starting with that irresistible aroma that fills your kitchen 20 minutes in. When you dress it up a bit with some heat and ginger, and some nice olive oil, you’ve got a weeknight side dish worthy of anything else you are serving up tonight. 2. Add olive oil, garlic, ginger and red chili powder, to florets and combine well. Season with salt and pepper. Roast in oven for approximately 40 minutes (time may vary depending on desired crispiness). I roast cauliflower and asparagus all the time. For cauliflower, the simplest is olive oil, salt (more than you think), pepper and for the last 10-15 mins, some slivered parmesan-reggiano. Very tasty. I haven't seen cauliflower at the NYC Union Square farmers' market lately - at least, not at the vendors I frequent. LOL about the brave face on carrying bags of beets and kale! Thank goodness for one pot kale and quinoa pilaf! I have a similar problem - often leave out the side dishes or stick to are bones green salads and basics. This looks manageable though, will have to give it a try! 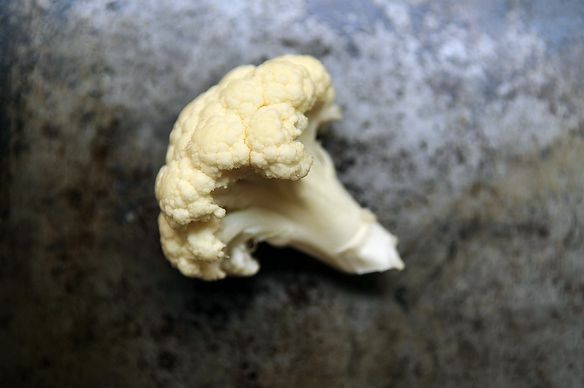 Jenny - instead of florets try slicing the cauliflower into very thin slices, from top to bottom through the head of cauliflower, avoiding the stem. It roasts in about 25 minutes that way at 425°, and gets all brown and crispy around the edges. I do that with only olive oil, salt and pepper, and it's wonderful, but I'll try your spice mix sometime soon. wow that sounds great. i really need to cook more cauliflower generally. i can't wait to try this method. I've made roasted cauliflower about ten times (and broccoli and Brussels sprouts each an equal number of times) since the method was first revealed to me on this wonderful site a few months ago. I can't get enough of it! I so enjoy seeing all these great variations. Keep them coming, everyone! I have exactly the same problem, and roasted cauliflower or broccoli is a staple that I tend to forget about. Lately it's been kale chips or creamed kale, too. Sounds fabulous! I love the roasted cauliflower with vinaigrette from Parisian Home Cooking. You baste the cauliflower with butter, lemon juice and nutmeg. Rich and yummy!